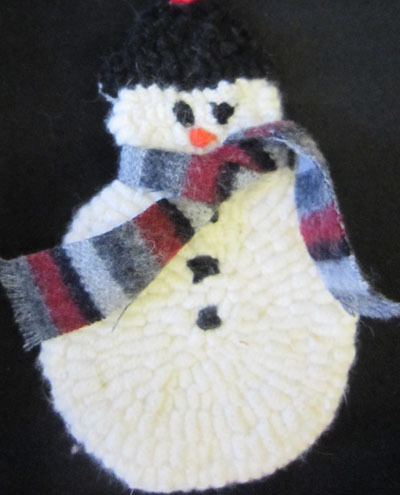 We missed our January meeting due to the snow, so were delighted to meet up again. 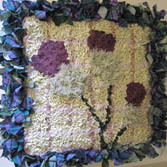 The theme for this month was prodded flowers, and we were lucky to be shown some of the flower projects started at Reeth this year under Gene Shepherd’s tuition. 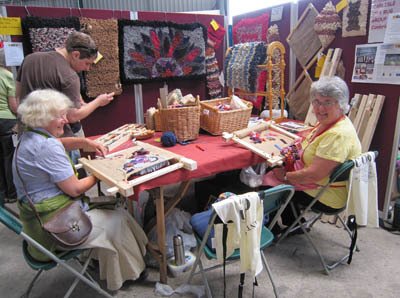 Gene Sheperds Web Page and has lots more pictures of the Reeth rug retreat. 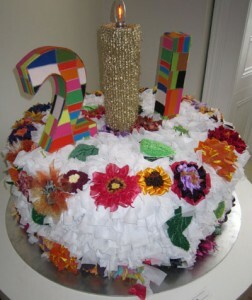 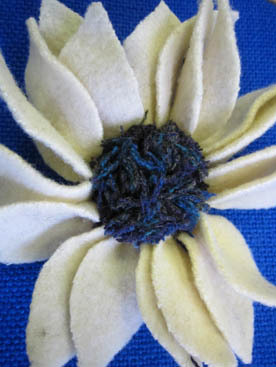 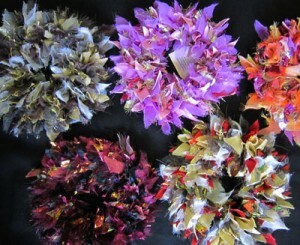 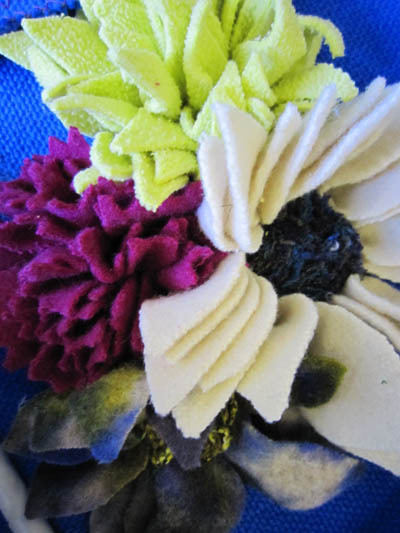 Then we all cut up loads of dyed blankets to start making the flowers. 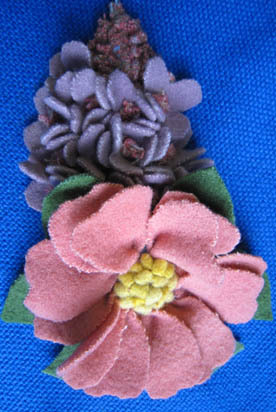 This is one of the individual flowers that we managed to finish. 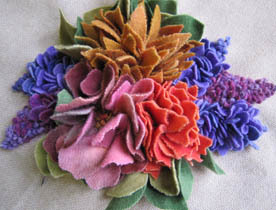 This is another version of the prodded flowers, with all sorts of extras added, wired ribbons, buttons and felted flowers. 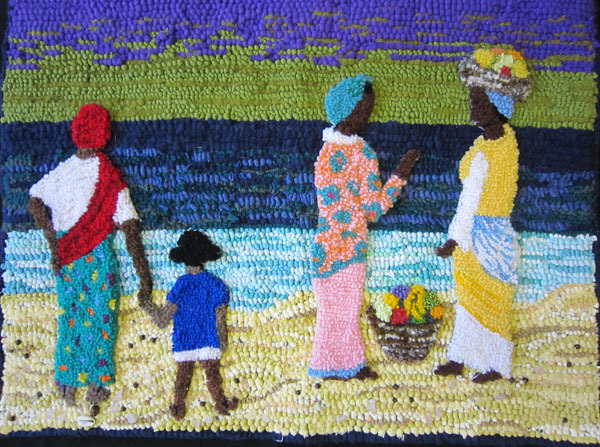 If any of the other overseas groups who participated with sending thier postcards would like links to thier rug groups pages, please contact us, and I will add them as well. 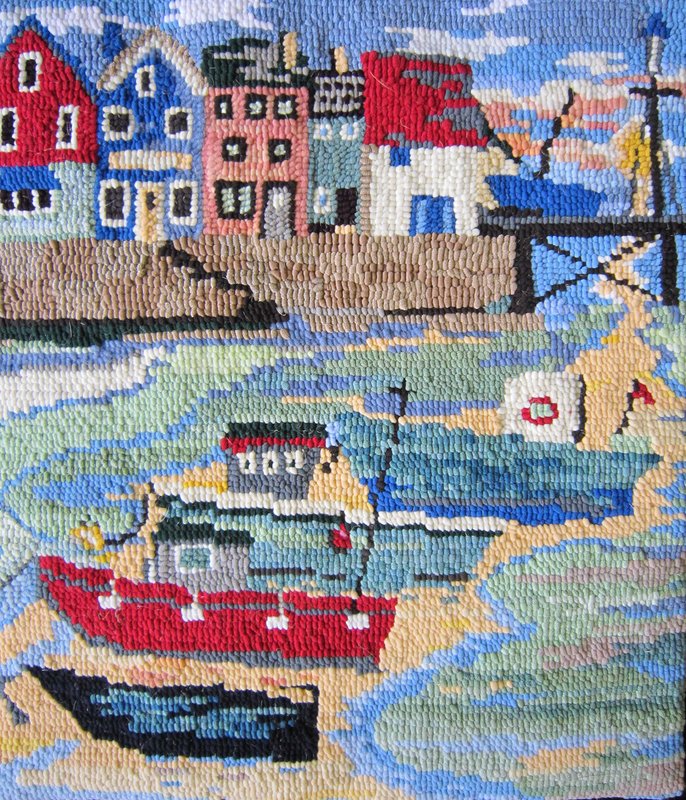 This rug was made by Barbara Hallas who sadly passed away some years ago. 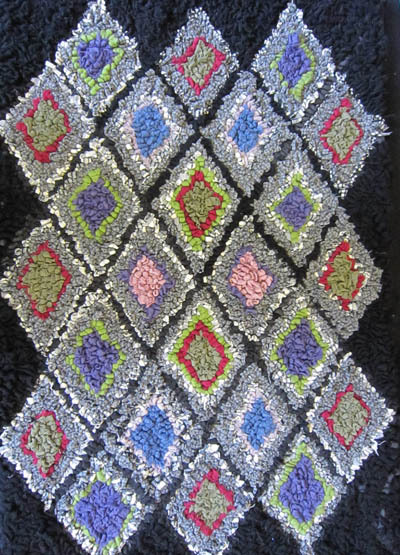 She was well known as a quilter and she also took up rug making and used to come to our meetings. 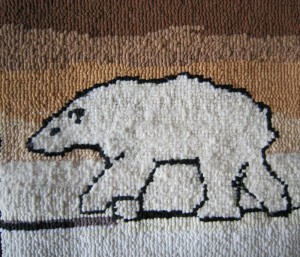 The rug is now owned by one of our group. 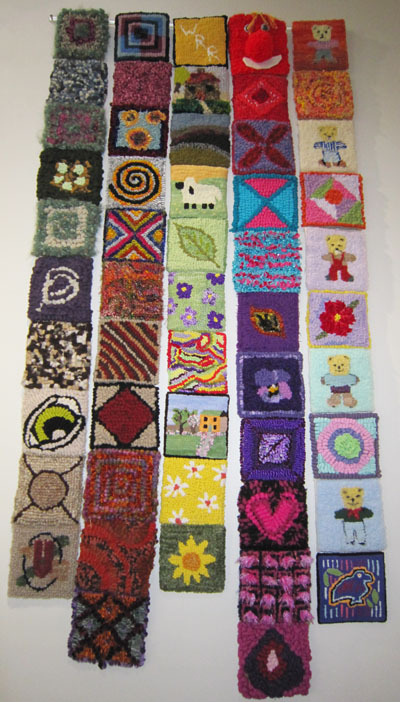 Isobel came to collect some rugs that had been in our exhibition, and also to show us a project that she is doing with the Airedale ruggers. 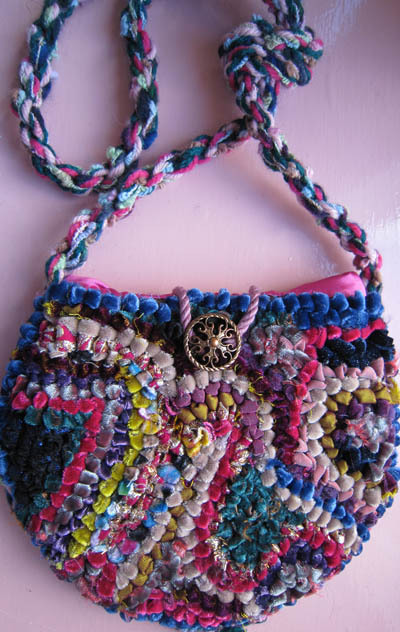 The red bag below made by another member, has a lively mix of colours and textures. 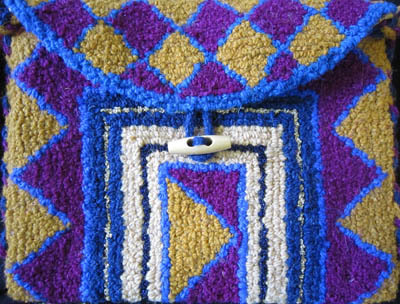 The show and tell aslo included some bags hooked in velvets and with straps made using a battery hairbraider. 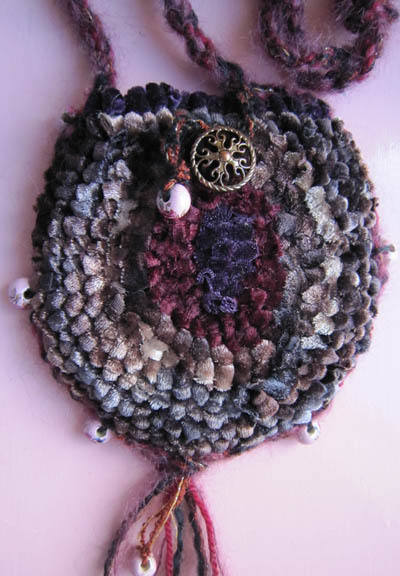 And finally, inspired by one of the projects in Theresa Pulidos new book, “hoop, loop and lock” this is one flowery spring cottage made in locker hooking. 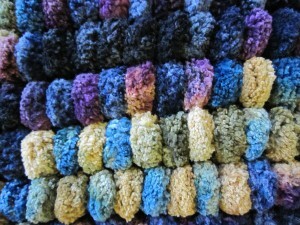 The meeting this month included a talk about yarn sewn and reed stitched rugs. 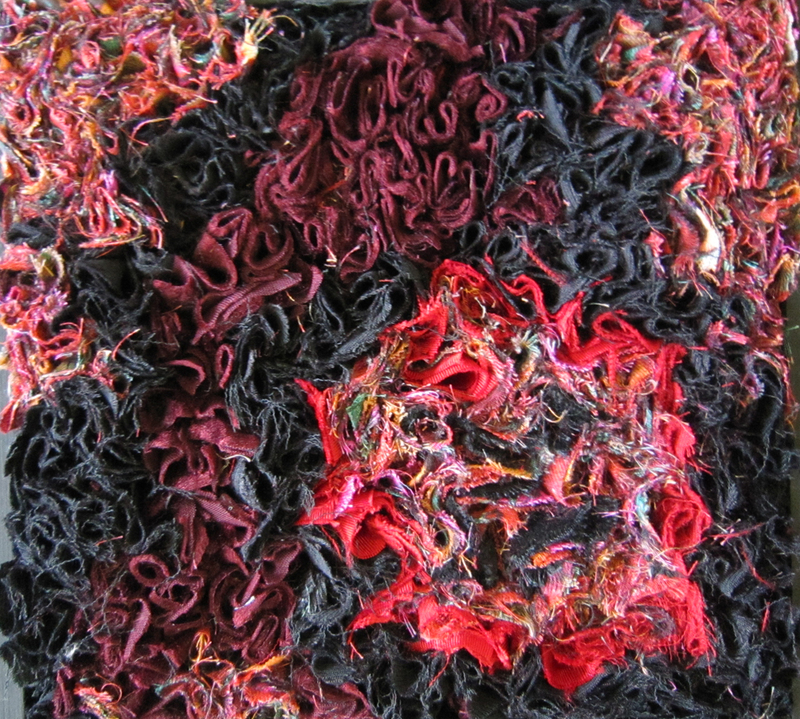 The Kopps thought that these early rugs were some of the most beautiful, and we were set a challenge to see how to use the stitches in contemporary rug making. 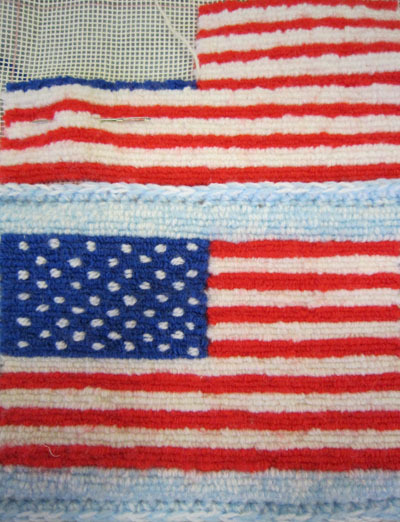 Joel and Kate Copps book “American Hooked and sewn rugs” includes a section on these rugs. 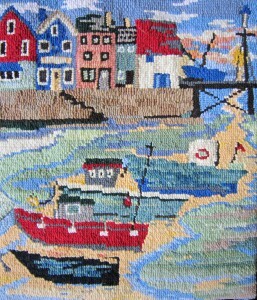 To read more about these rugs online, in amongst the papers and articles of the Old Sturbridge Village Museum in Massachusetts there is a publication by Nina Fletcher Little called “Floor Coverings in New England before 1850” which includes information about these rugs. 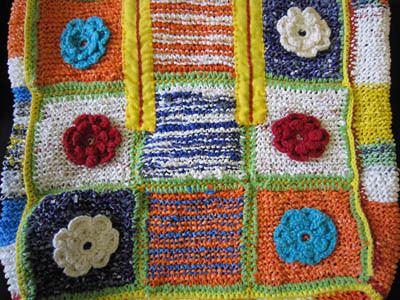 Our show and tell this month is a mix of techniques and styles. 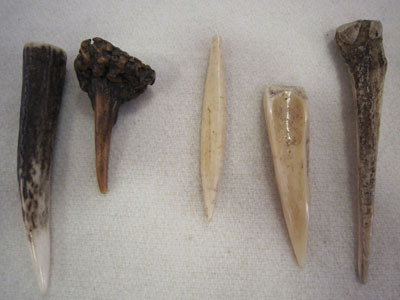 The first three all use proddy, but look so different. 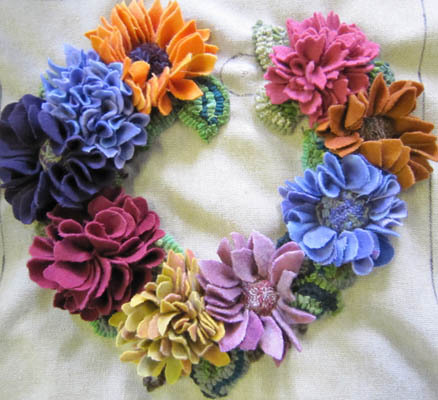 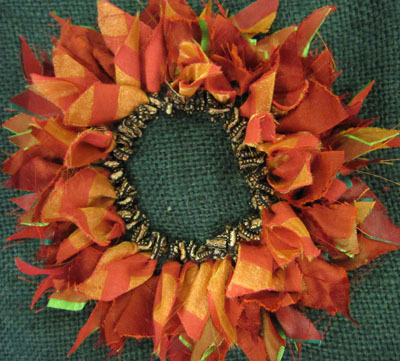 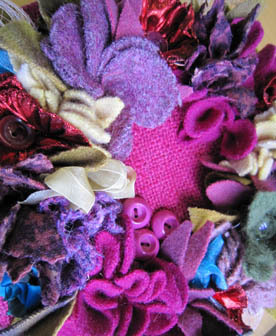 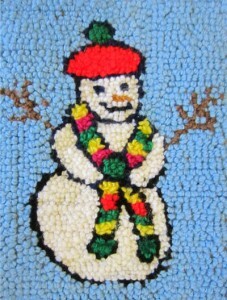 The rainbow is a test piece for a larger rug, the two wreaths represent spring and Christmas. 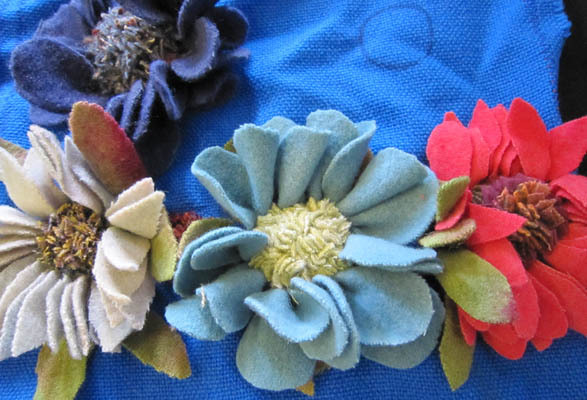 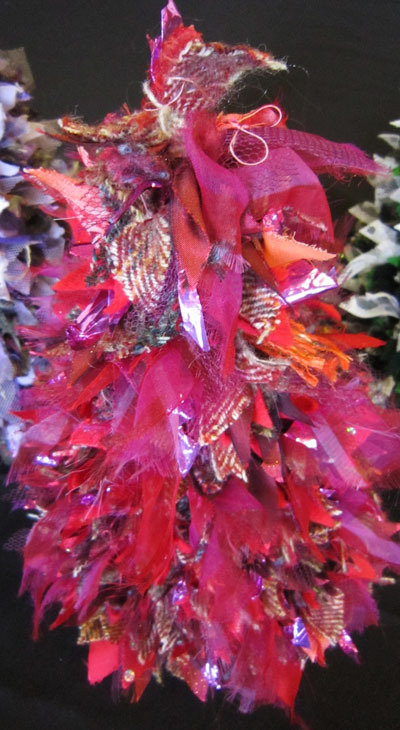 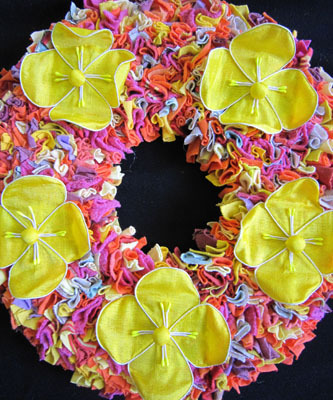 The flowers on the spring wreath are recycled from serviette rings. 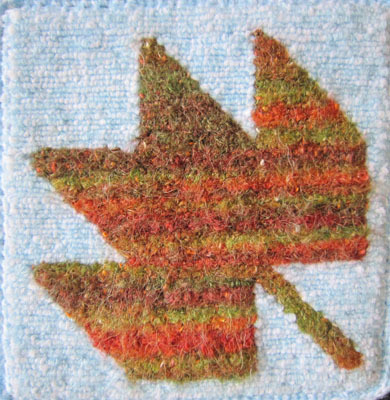 The next show and tell is a small fine needle locker hook maple leaf. 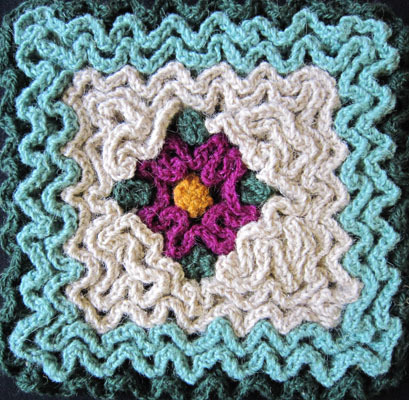 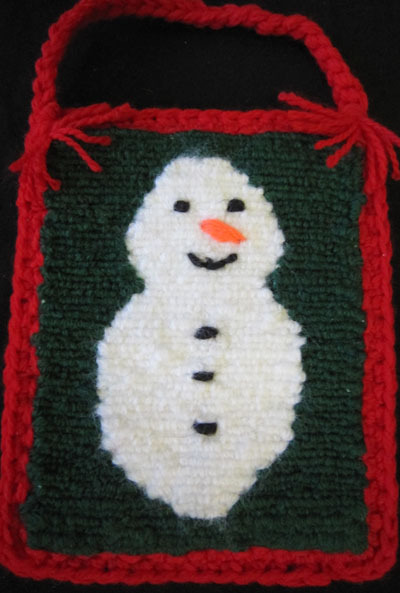 A few meetings ago some members of the group explored wiggly crochet, this small mat was made following instructions in Susan Lowmans book “Wiggly Crochet rugs”. 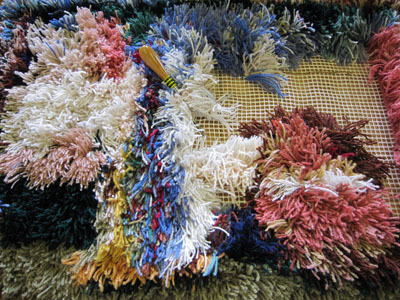 The last rug is one made with the toothbrush technique. 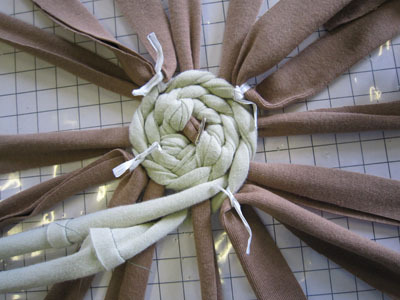 This is always a bit confusing but this one is the technique used by Aunt Philly, and alternatively described as Amish Knot. 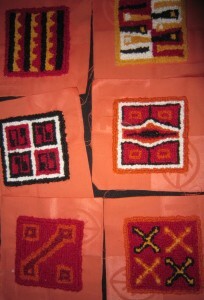 The group also had quite a few rugs in progress this month, but I will wait until they are finished before posting them. 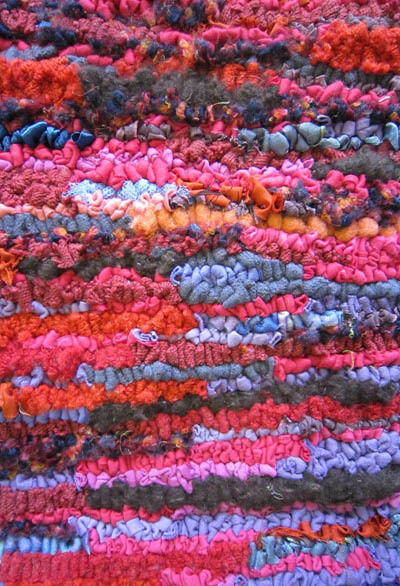 This next month we are off for our rug retreat at Cober Hill near Scarborough, so hopefully there will be interesting rugs to show. 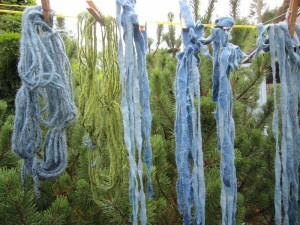 If the weather is good we are also hoping to do some wool dyeing. 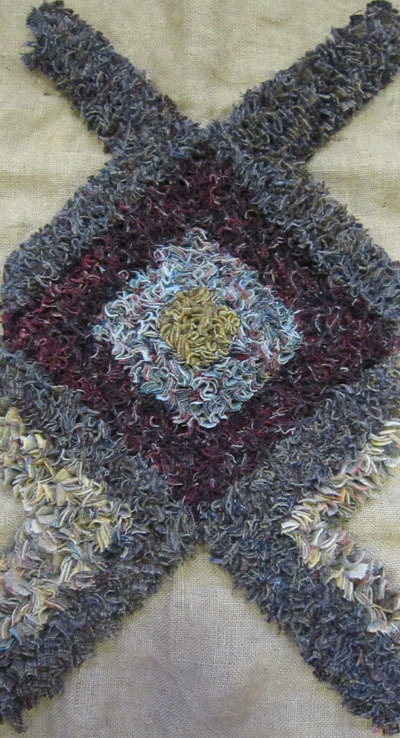 Our annual rag rug making weekend at Cober Hill was a great weekend. 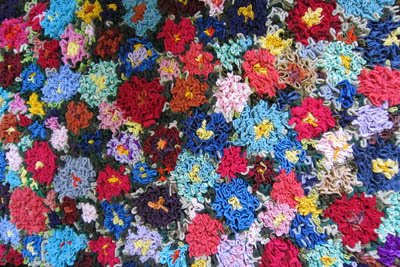 We should have some lovely rugs made with all these wonderful colours. 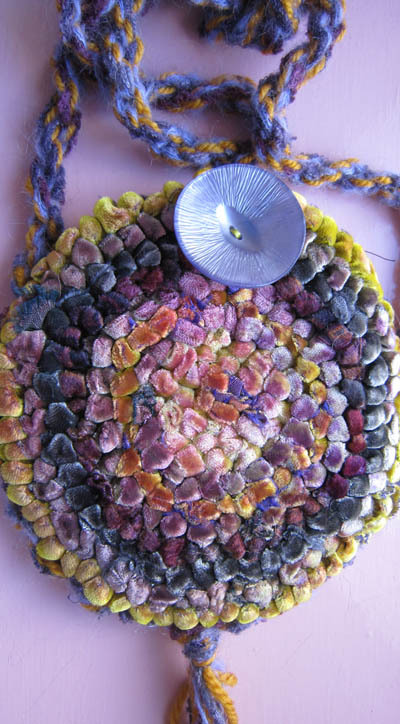 Ilene Scholes kindly talked to us about rug tools that she has collected. 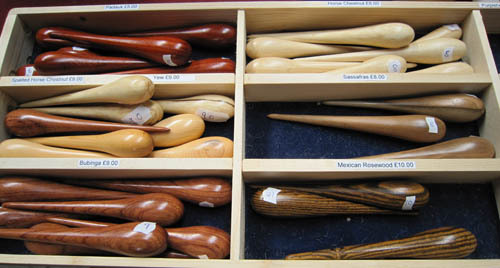 It was interesting to see that some of the wooden ones were carved in a shape similar to the bone and horn ones. 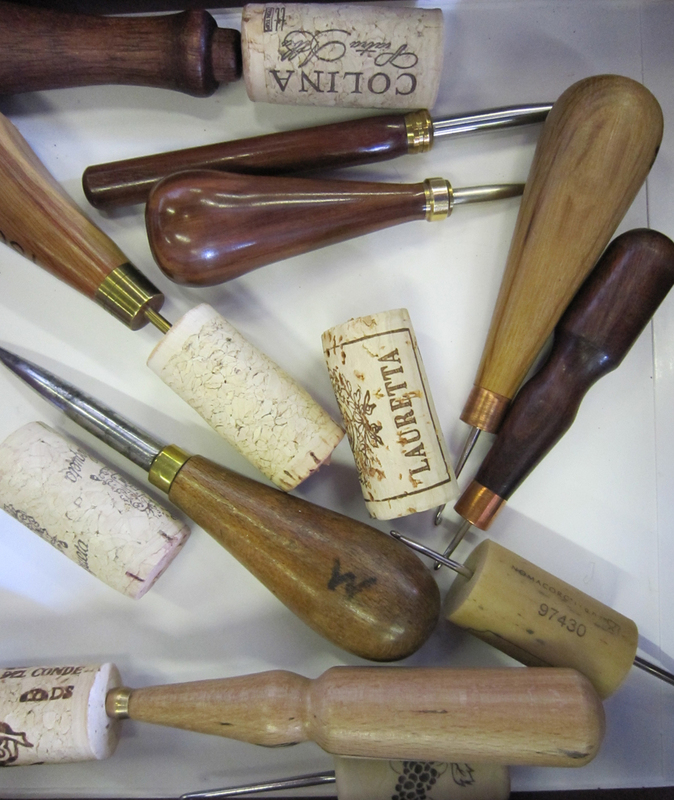 Often tools were made of anything that could be adapted. 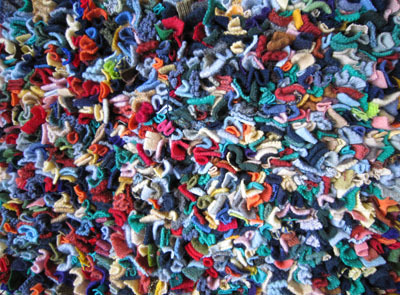 and we thought that the wool works well and makes a soft rug. Wendy brought along a half completed rug that had been donated to her, shown here for Retro fans. 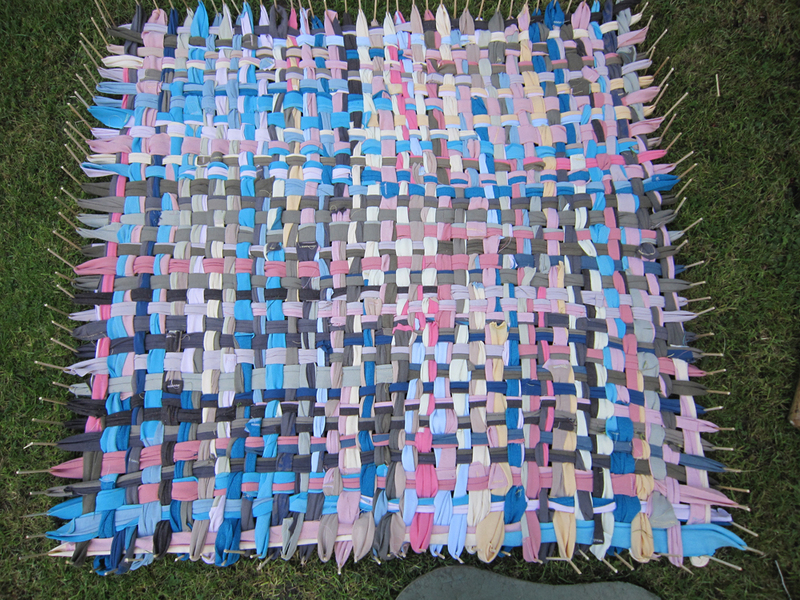 The canvas was very floppy, but ironing it has helped revive the stiffening. 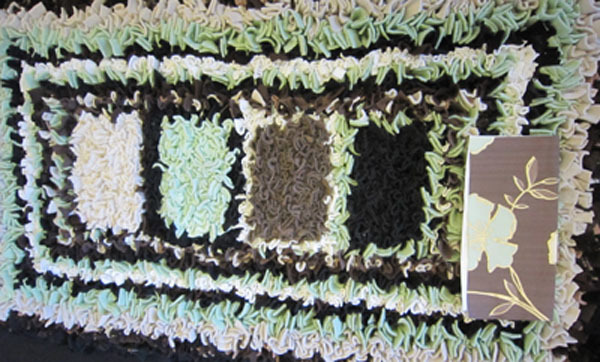 This photo shows our hard work, and then there are some individual photos below. 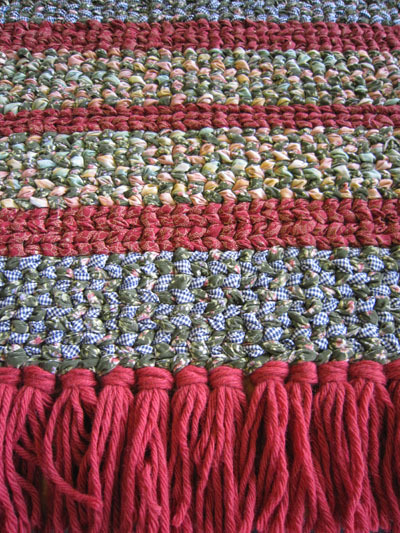 We will include other rugs when they are completed. 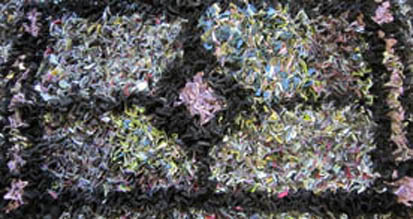 After Cober Hill we met in May to sort out any rugs that had been in the Tolson exhibition, that were not going onto Red house. 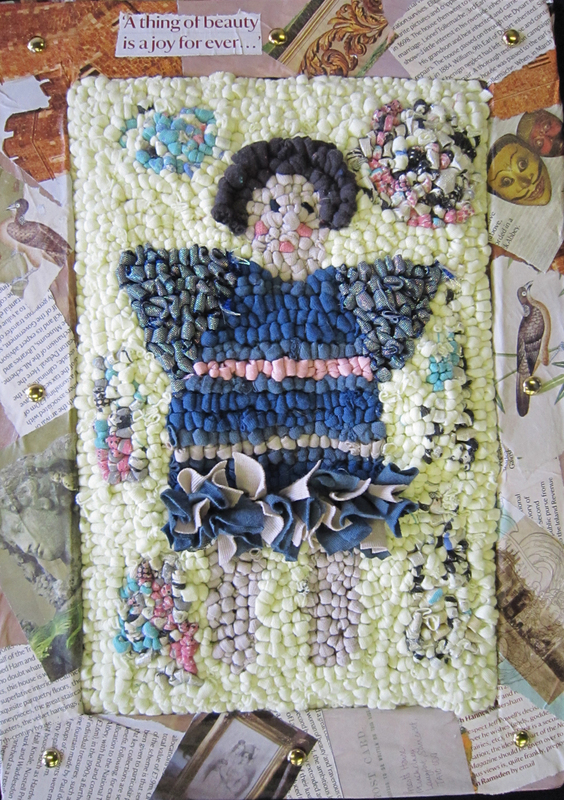 I have just been over to Red House to do a talk, and to see the lovely exhibition, it looks fantastic, and our thanks to Jenny and Helga for its safe transition. 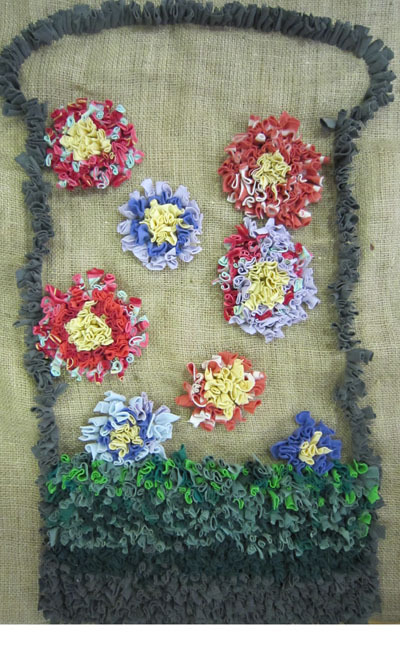 At the period garden festival at Red house members of the group will be demonstrating rag rugging on the last Sunday. 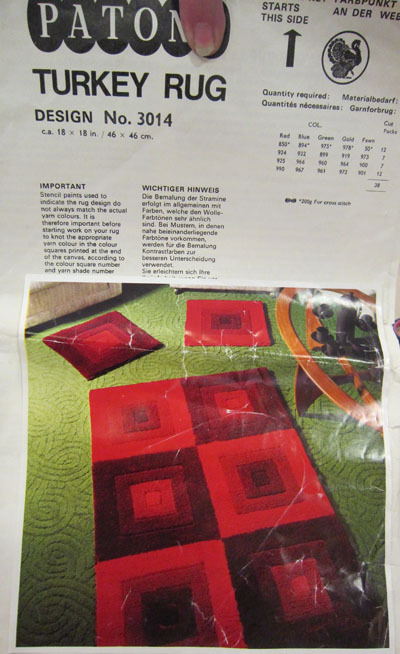 We also looked again at twined rugs, using Bobbie Irwins books as our technical support… the instructions are lovely and clear and very easy to follow. 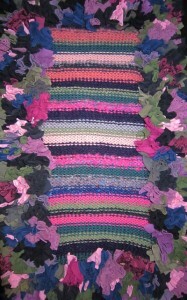 This is a rug in progress, and a similar finished one , both made by Kay. 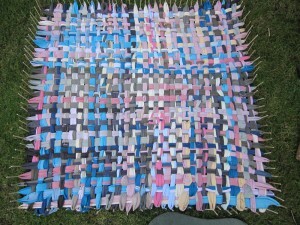 This is the start of a twined seat pad or basket: the first rows over 4 crossed warps have been worked, and I am just adding in extra warps, secured with bin tyes. 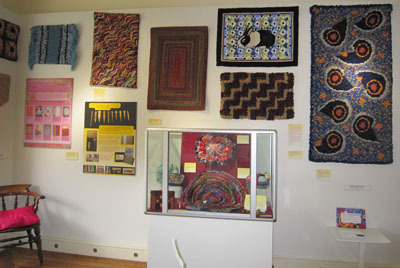 I was able to go over to Nantwich to the Museum to join them for the start of their exhibition, A Celebration of Rag Rugs. 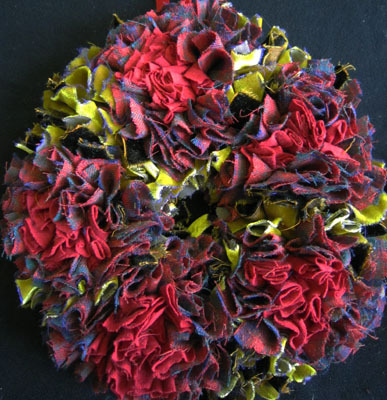 Its on till the 17th July, so try to get over there, its well worth a visit. 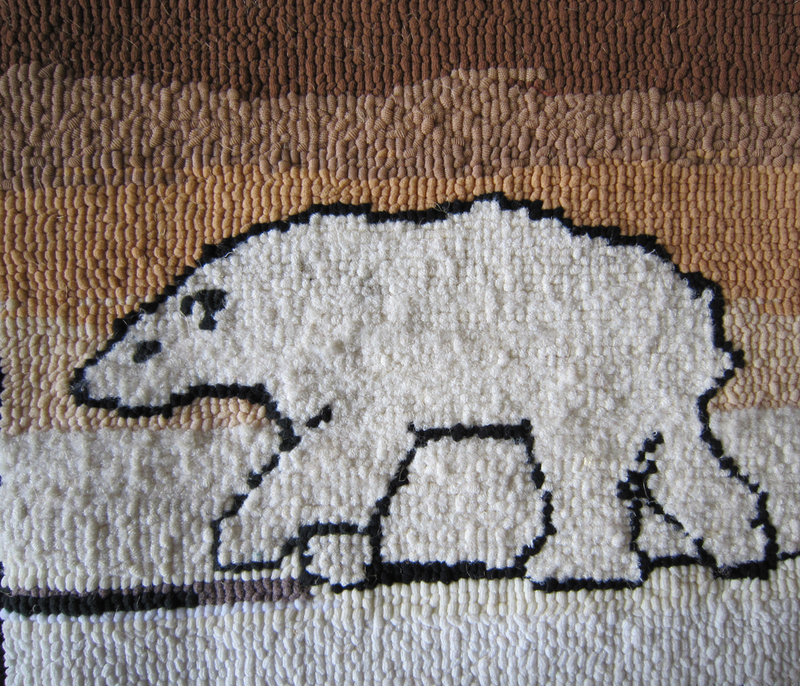 I particularily enjoyed seeing some rugs that I had only seen in books before. 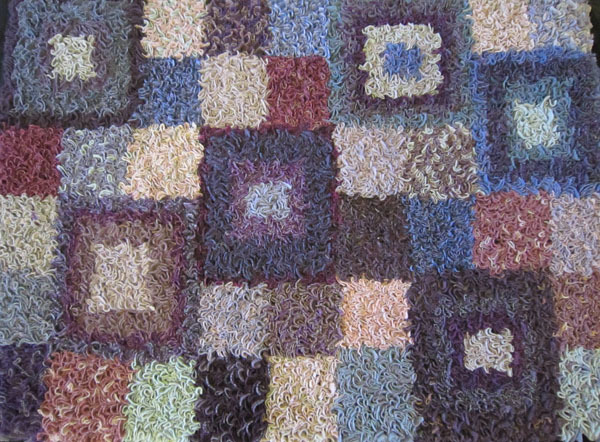 Below are just a few of the rugs that I enjoyed, by no means exclusive, and its good to see so many different makers all in one place. 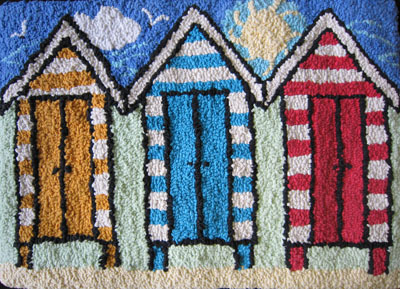 This rug is by Ali Rhind, I loved the colours and the design. 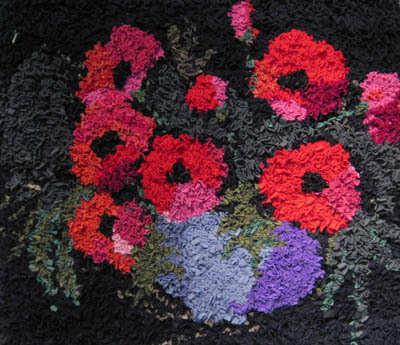 In complete contrast this poppy rug by Janet Holden provided a vivid spot of colour. 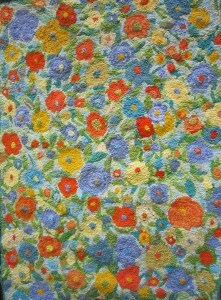 Another botanically inspired rug was by Deborah Hastings, who often combines both proddy and knitting. 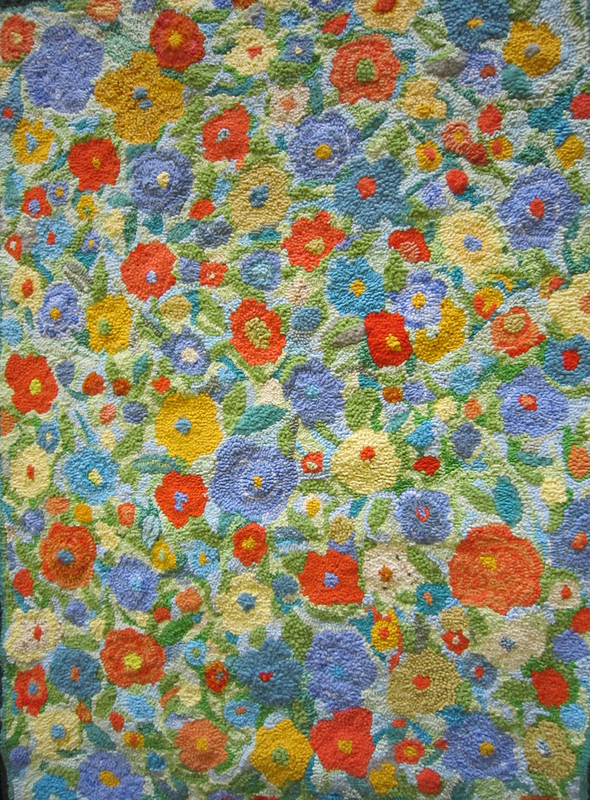 I also liked this rug by Lynne Stein, she pack her multitude of materials very close together, fro lovely textures, and often combines her rug making with felting. 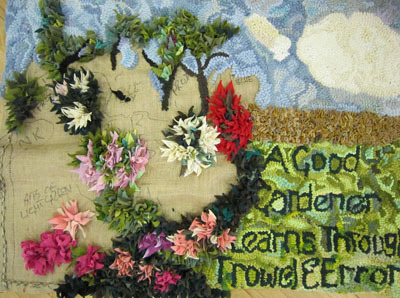 I am busy growing vegetables at the moment, not nearly so colourful as Lynnes allotment. 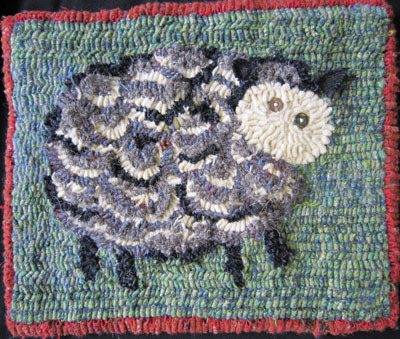 Lastly there are lots of rugs by Louisa and Lewis Creed, Heather Ritchie, Jenni Stuart -Anderson, Debbie Siniska, Jane Lane, Ann Davies, and more, so well worth a visit. 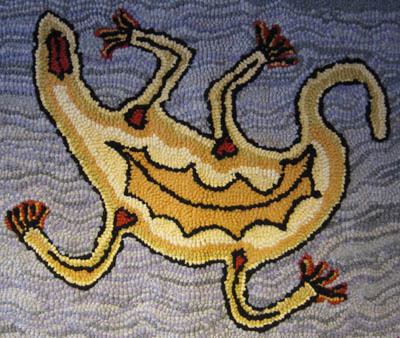 The frogs are just hatched in my pond at home, so here is Lewis Creeds very Christmasy frog. 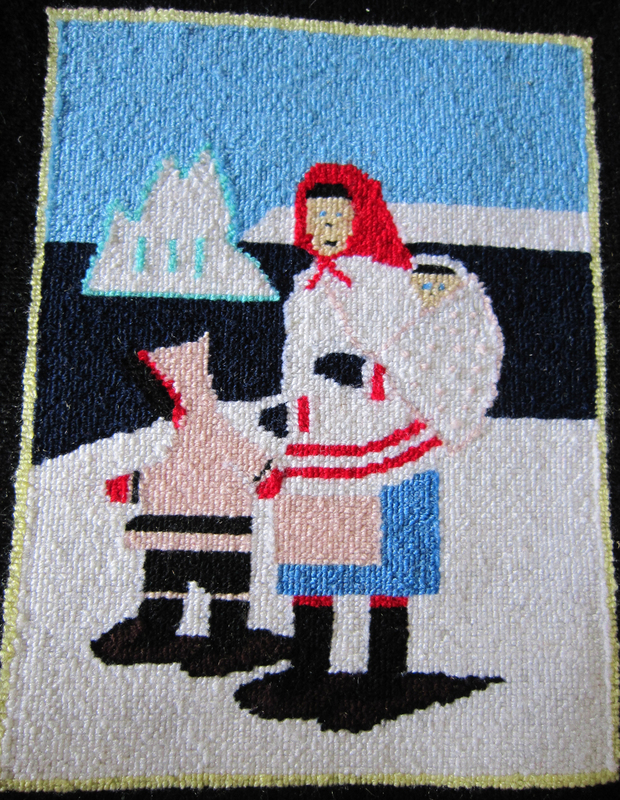 The exhibition also includes some old rugs from the museums collection, and this one is delightful. 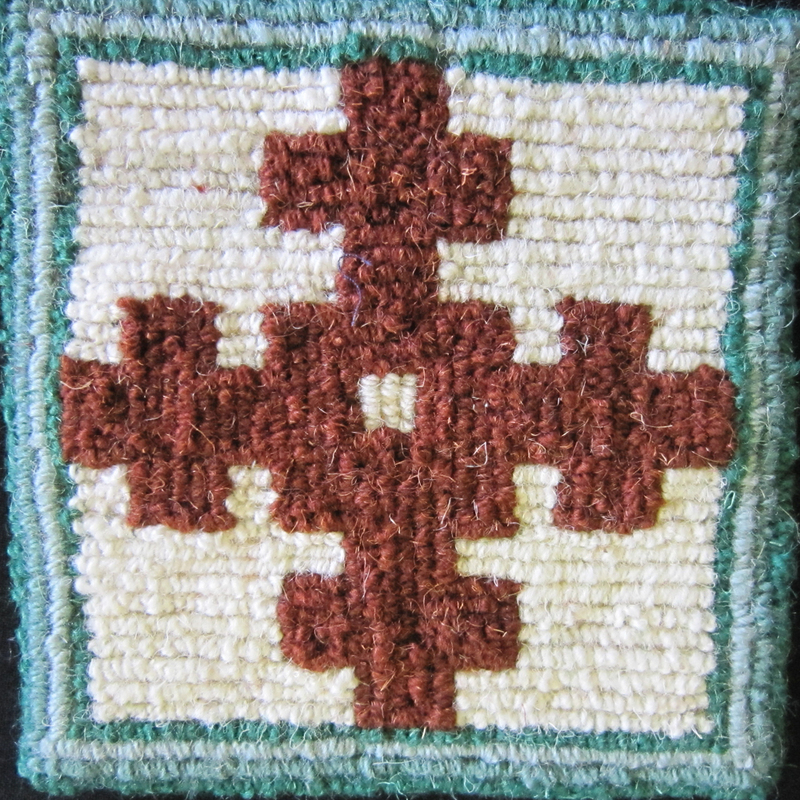 It almost looks as if it was inspired by a braided rug. I would like to thank the Museum for allowing me to take the photos. 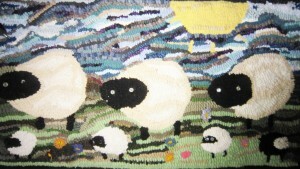 Now onto the West Riding Ruggers meeting in June. 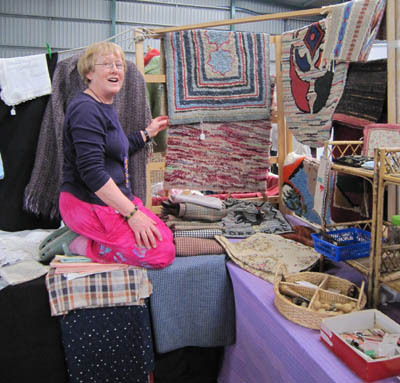 Our June meeting was the busiest we have been for a while, and we had to extend the area for displaying the rugs that people brought along. 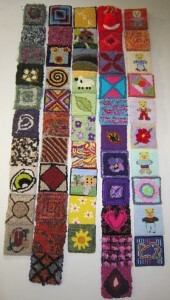 We had a great variety from knitting, hooking and proddy and toothbrush, so here are the finished rugs. This proddy rug looks just as good from the back as the front… unlike the Northern ruggers we dont always piggy back our tabs, but the back of this rug is so neat that it will not come undone. 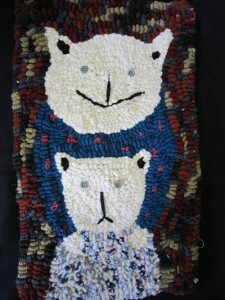 These hooked primitive cats made me smile. 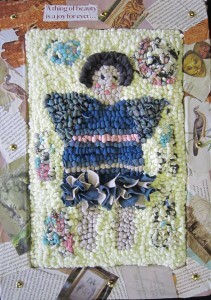 Next a mirror hanging,originally made for a workshop. 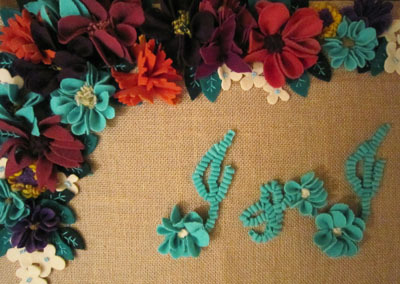 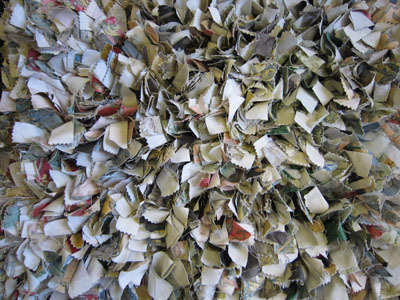 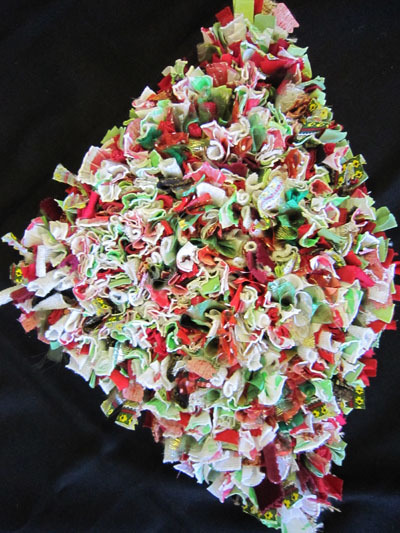 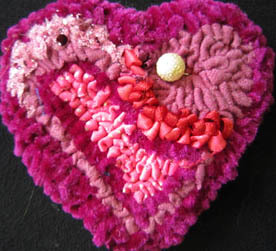 A good way to use up all sorts of lovely scraps, they dont take any wear as they hang on the wall. 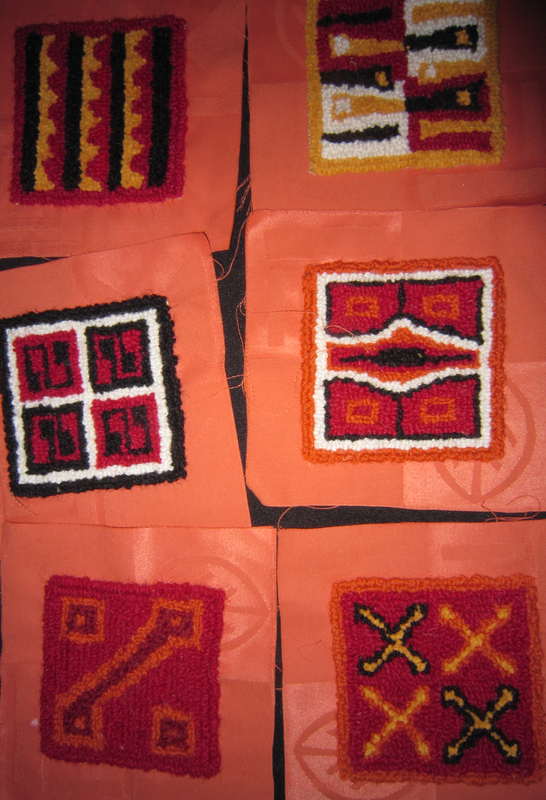 Continuing small, these fine locker hook flags and leaf are soon on their way over the pond, as presents from one of our rug makers to friends and relatives. 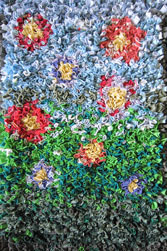 Flowers seem to be popular this month, with this proddy rug made for the back of an old cane chair. 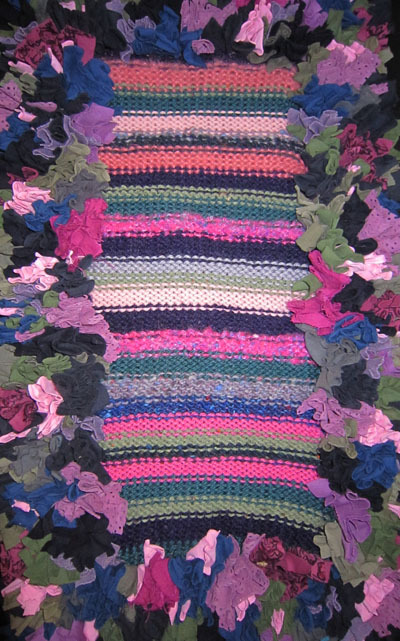 Two of the group have been working on toothbrush rugs, on in teeshirt and one in cotton. Finally after acquiring Sheila Paines book on Amulets, this wall hanging emerged as a personal amulet. 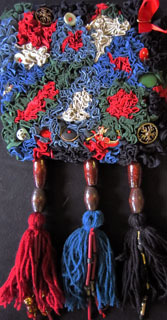 The decoration was gathered from the small flotsam that we collect in our journey through life, and has personal significance to the maker. 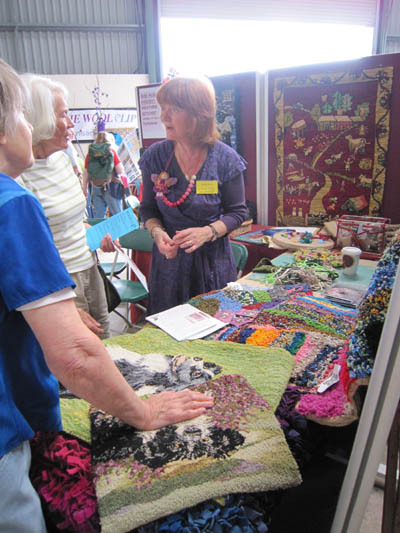 Woolfest was fantastic this year, we spent a whole day looking, buying and talking. 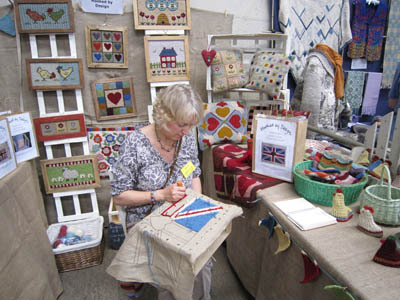 Many thanks to all those stall holders who make it so enjoyable. 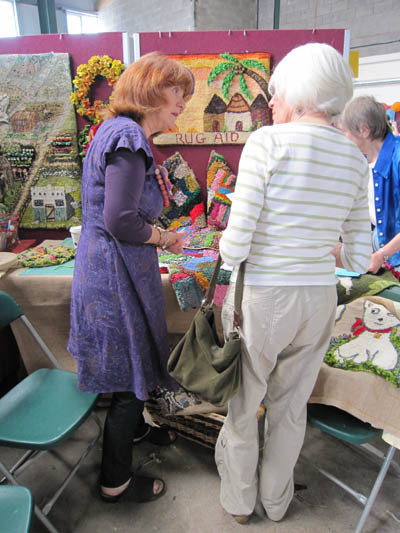 This stall was the Carlisle group of U3A. 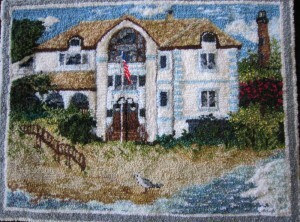 I treated myself to new prodder made by Judith Harrisons husband. Ive seen hardwoods like this made for spinning, but not for rug making before. 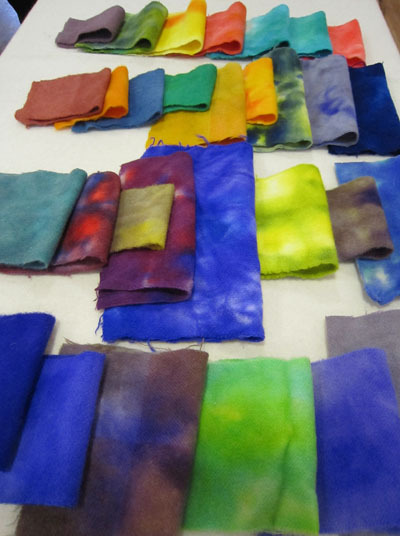 Then onto Cillas stall, as always I love all the dyed wools, and plenty of inspiration for using them. 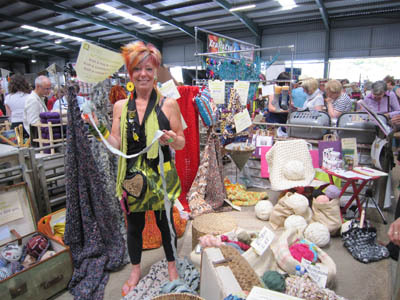 Opposite Cilla, Maureen was selling her vintage textiles and some vintage rugs and tools. I loved the vintage rugs, but have no room to house them sadly. 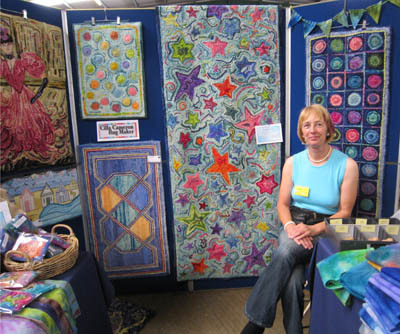 The Hooked by Design stall looked lovely, one of the nice things about the stalls this year was how different all the rug stalls looked. 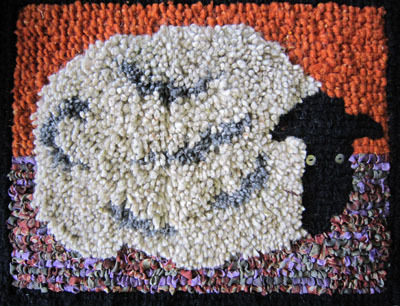 From delicate to extreme rugs, Ingrid was selling her large wool selvedges for knitted rugs. 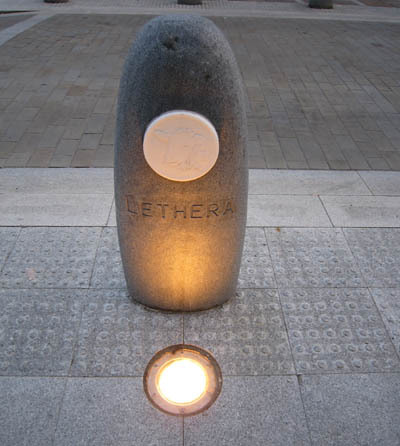 Back in Cockermouth, the bollards continued the sheep theme. 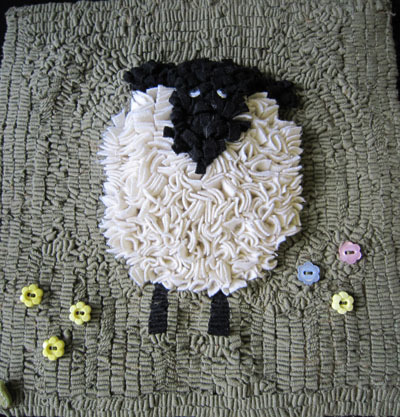 And finally… I think we all owe a big thank you to the organisers of Woolfest this year, for putting together such a fantastic event in what has been such a difficult time for the area. 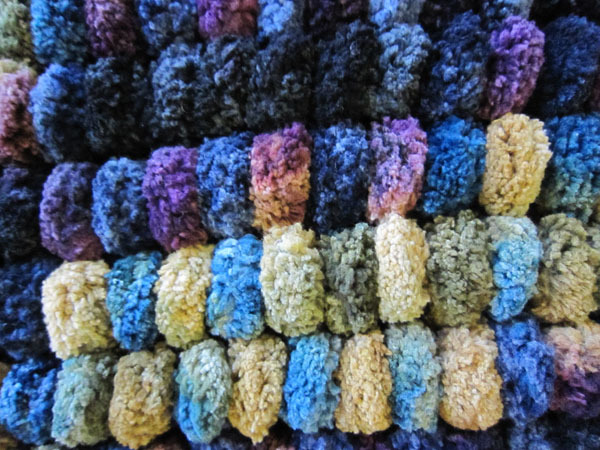 We have had lots of interest from new members as a result of our exhibition at Red House, and they are all busy starting rugs now, so watch out for some lovely rugs from people who are new to rug making later this year. 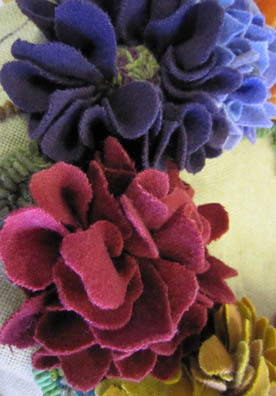 We have started on a new project, which we hope to showcase on the site next summer. 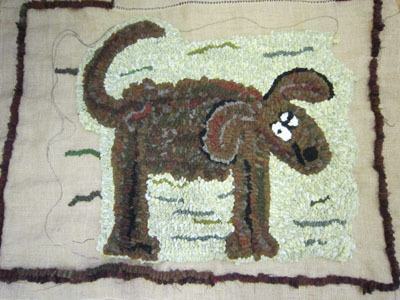 Each person is designing and making a rug inspired by a book on rug making in our collection. 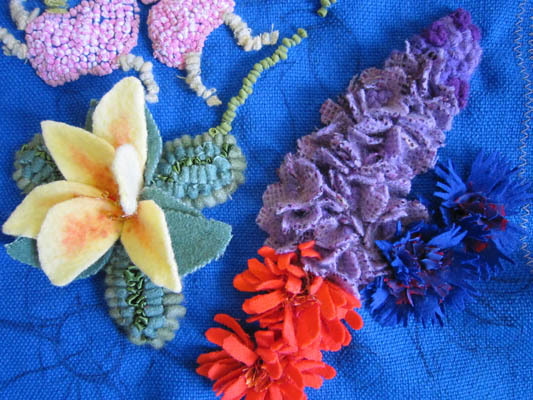 As our real exhibition is still travelling around, this time to Bradshaw Museum, the new exhibition will be a virtual one. 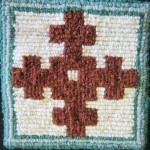 So what has the group been up to? 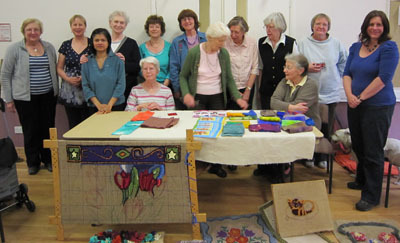 In July it was our AGM, and we also used the opportunity to host a Marie Curie Tea Party. 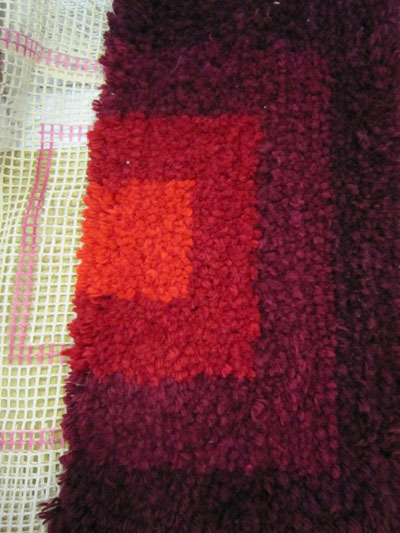 We also learnt about making Grenfell style fine rugs and wall hangings. 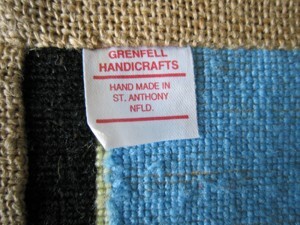 This small mat comes from Grenfell . 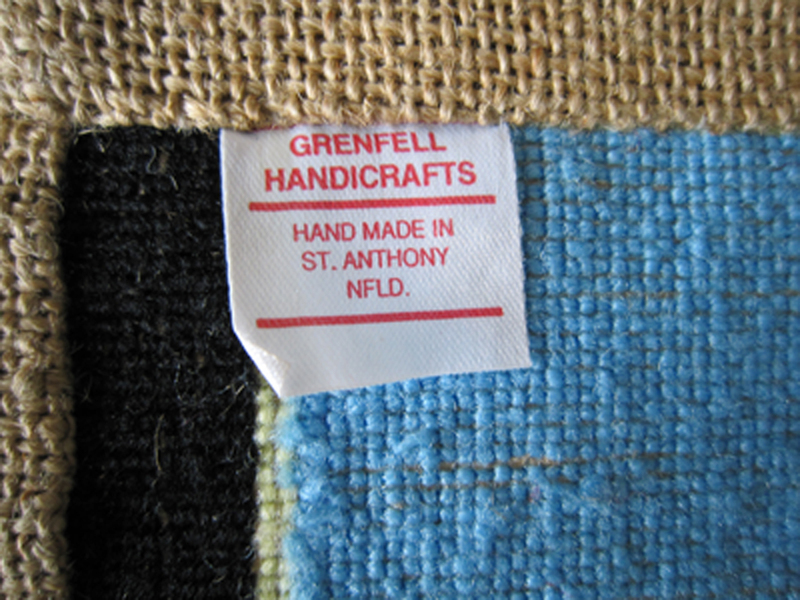 Many of the grenfell rugs took their designs from the natural environment around them. 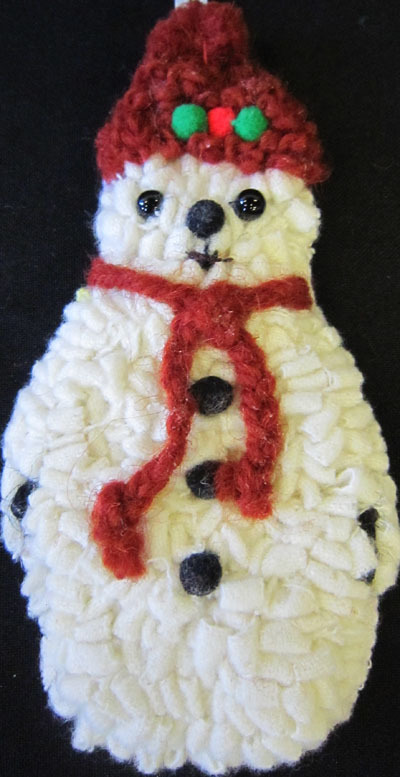 The bear below is an example made by a member of our group. 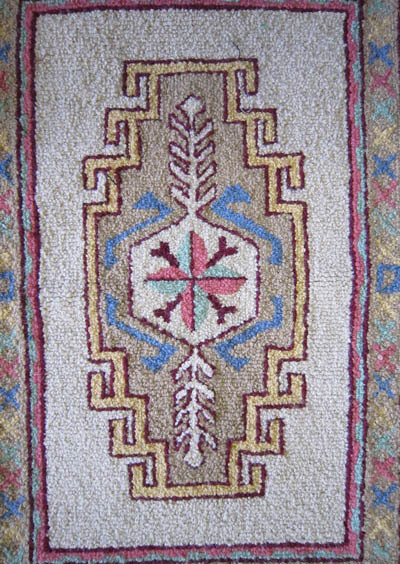 Another characteristic of these rugs is that they are hooked in straight lines. The pictures were originally made using fine stockings, and now our group use fine tights, hooked with a fine hook. A practise hook can be made by adding a cork to a fine crochet hook. 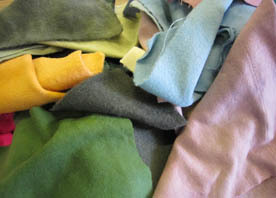 The sample below shows some of the colours that can be achieved by dyeing tights. Over the summer months I have been experimenting with dyeing material in glass jars using solar energy. 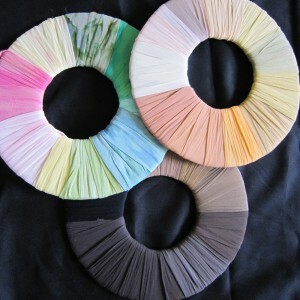 It has been great fun, even if the results are unpredictable. 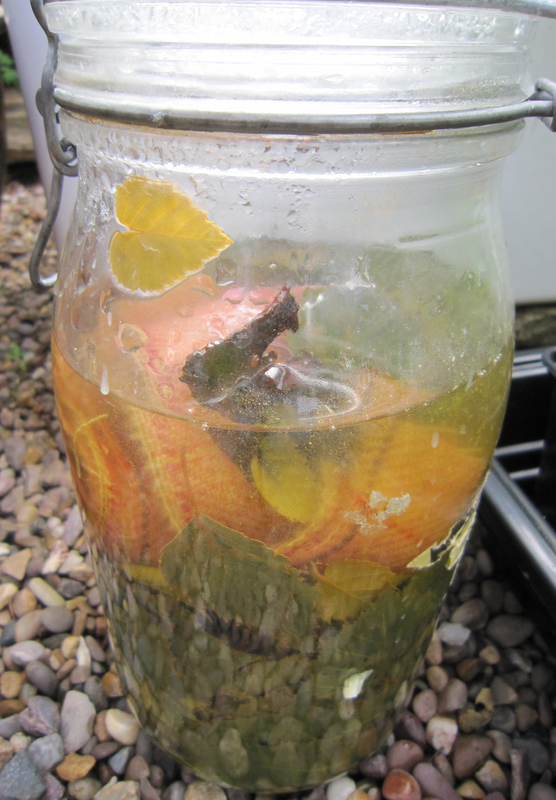 The jar here has birch leaves and alum mordant, which dyed the wool yellow. 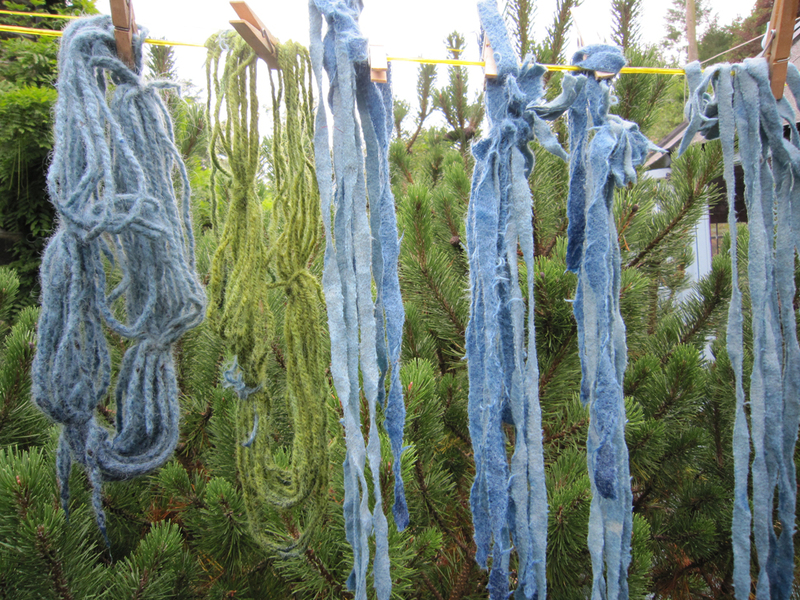 Continuing wiht the dye theme, I also dyed indigo succesfully… many thanks to the Mulberry Dyer for the stater pack at Woolfest… The green wool is weld overdyed with indigo. 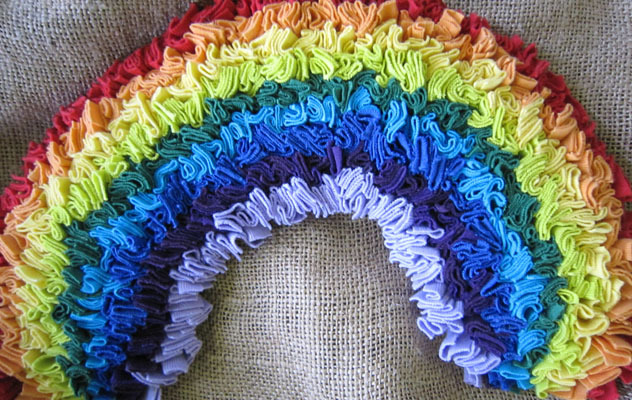 It took over twenty teeshirts and I did not like all the joins much at the end. 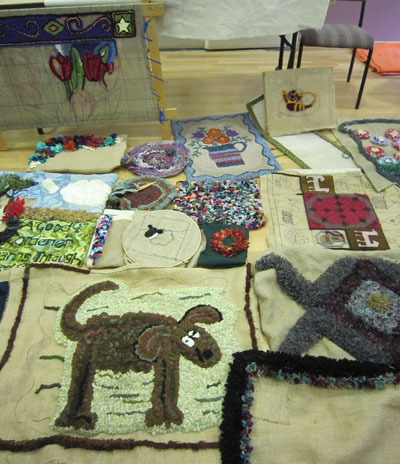 And finally.. rugs brought along to our show and tell. 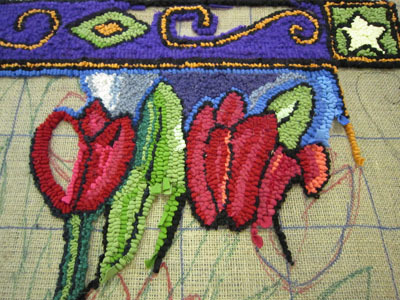 This is a small part of a larger wall hanging that will have lots of different needlework techniques included on it, coordinated by a group in Northumberland. 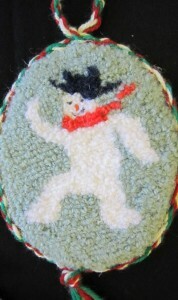 This small framed picture was inspired by Hungarian folk art. Our exhibition has moved to Bagshaw house museum, and looks beautiful. It has been fascinating seeing how the exhibition has looked in a variety of rooms from white painted walls as at this museum, to the very historic rooms at Tolson Museum. 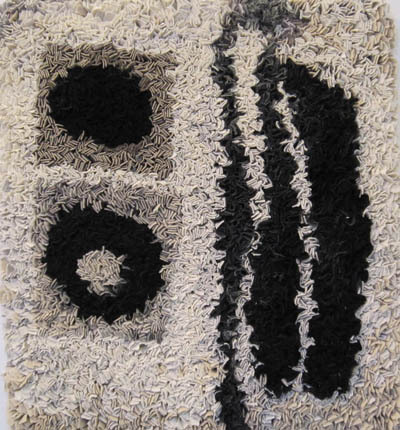 Each curator has also chosen to select a slightly different choice of rugs and tools, and hung the exhibition in different ways, which has made the exhibition come alive again. 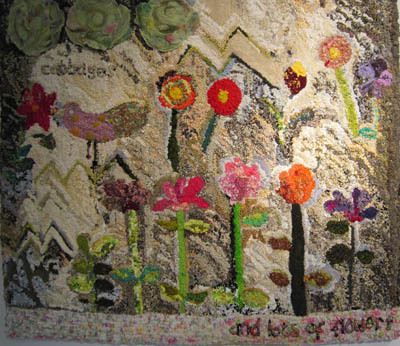 All the museums have been very pleased with the visitor reactions to the exhibition. 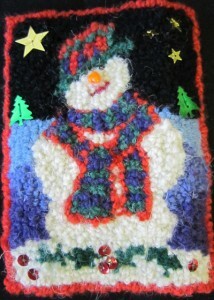 It would not be the lead up to Christmas without the group working on decorations. 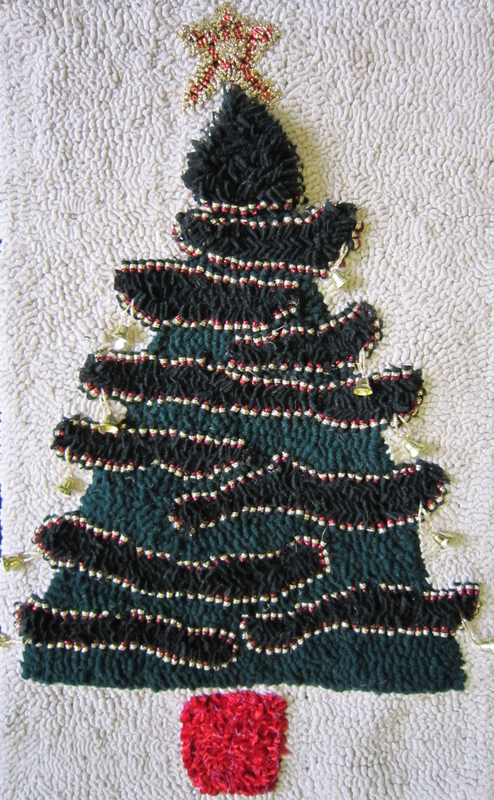 The lower pictures show the stages in making a cone Christmas tree, the upper images are some small wreaths, which could even be hung on the Christmas tree, and a swag made with ghiordes knot along strings. 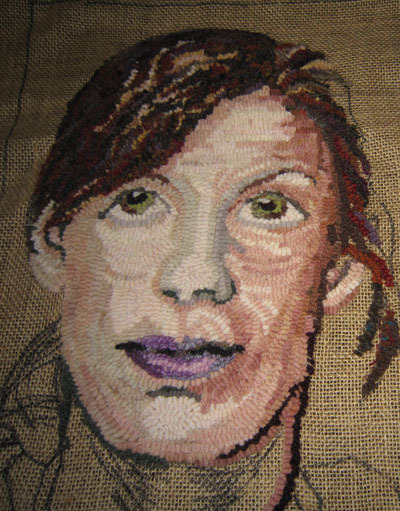 This portrait was worked on at the Reeth rug retreat, and is still to be completed, but it is fascinatiing to see how the shading works here. 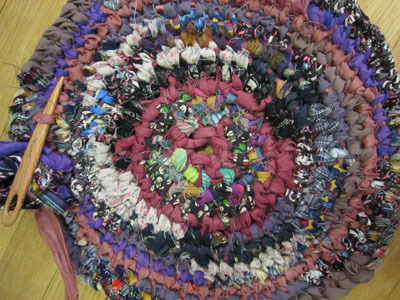 This circle is one of a number which will contribute towards a wall hanging for the new Baildon Community Centre. 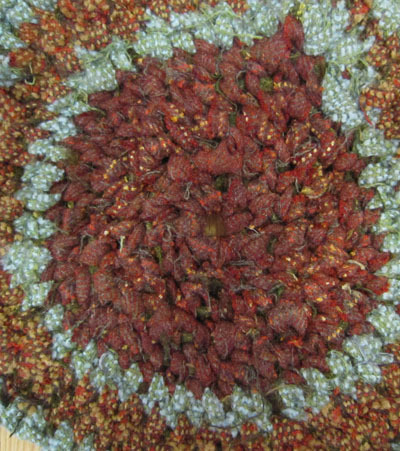 Each circle represents a local group. 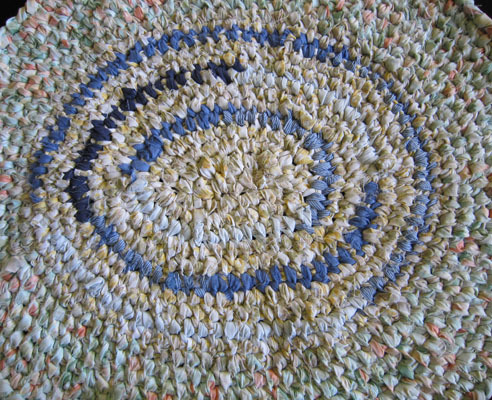 This rug was made by knitting the central portion on a chunky knitting machine, and then padding it, and then working the edges in proddy. 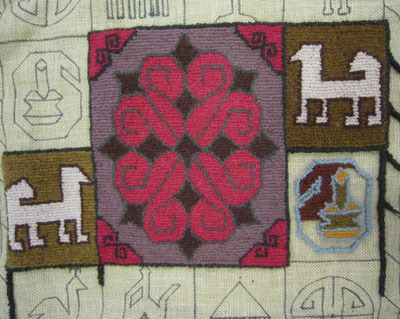 This rug attempts to copy an old rug I was shown while running a workshop. 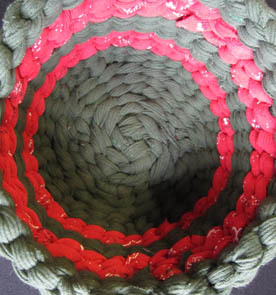 Each piece is knotted after pulling through rug canvas with a spring hook. 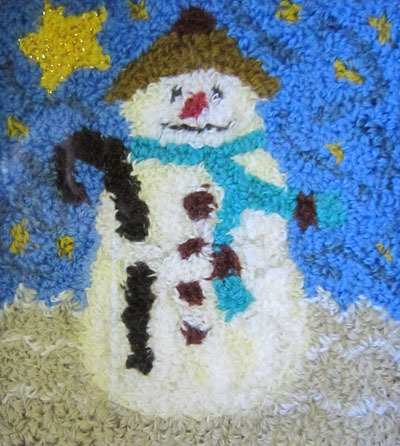 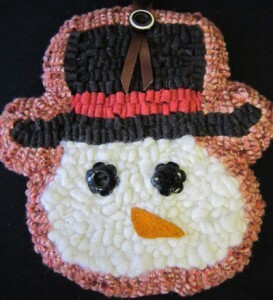 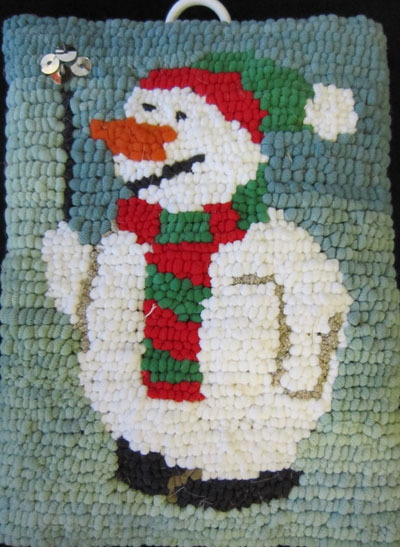 The December meeting was lovely, with everybody bringing food and showing their newly completed rugs. This year  our Christmas exchange  was around the theme of snowmen. 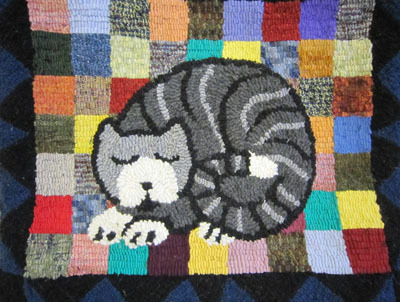 A quick reminder, from Jan 2011 our meetings will start at 1.30pm, because the museum has to close earlier in the afternoon. 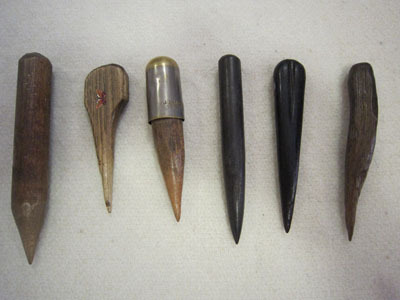 a quick note, you can just as easily make proddy rugs using an old fashioned dollypeg with one leg removed and the remaining one sharpened to a point. 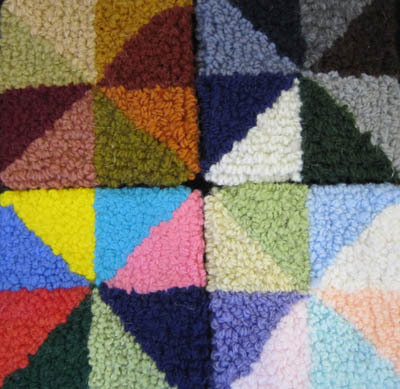 These rugs are worked from the wrong side. 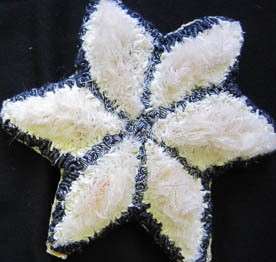 They end up the same on the right side. 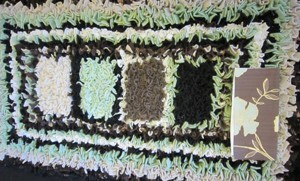 The green rug above is such an example, the photo includes the wallpaper that inspired the choice of colours. The lovely purples and lilac proddy rug, all in wools ,is made in the same way. 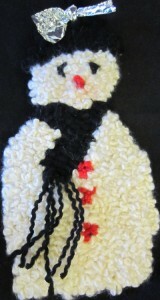 The picture below is actually part of a knitted scarf, put done with wool that has small pompoms along its length. 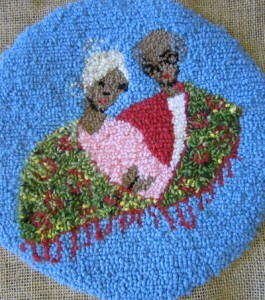 This African inspired rug explores a new technique, the figures are hooked and sewn over the background hooking. The figures stand out in relief. 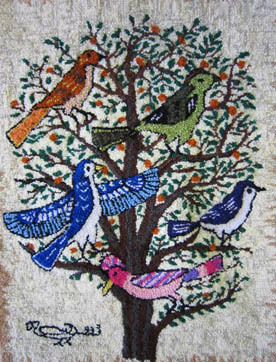 IT was inspired by the crow pattern in Punchneedle Embroidery by Barbara Kemp and Margaret Shaw.. Lark/Chapelle.. 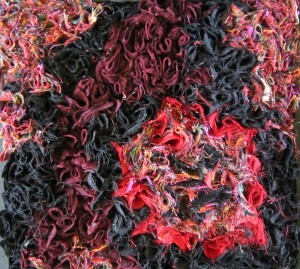 The shapes of the blackbirds emerged, rather plumper than the crows, well fed on digestive bisciuts.